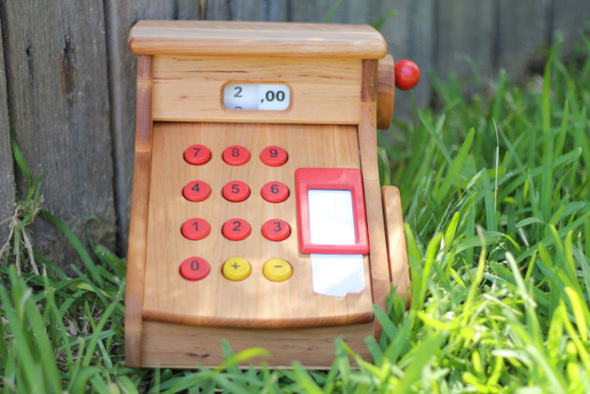 This post is by regular contributor Tricia Hogbin of Little Eco Footprints. I get overwhelmed at all the gifts my daughter receives at Christmas. I’m sure she does too. I’ve watched her move from unwrapping one gift to the next without pausing to register what she had just unwrapped. I’ve also seen her struggle to decide which new toy to play with, only to give up and play with a box or wrapping paper. Last year my husband and I started a tradition of less is more when it comes to Christmas gifts. We gave our daughter only two gifts. Both toys are still among her favourites. I love that either could easily last long enough to be played with by her children and grandchildren. We’ll be continuing our less is more tradition this Christmas, and will extend it to other aspects of Christmas. We’re planning less travel and less and simpler food. Tricia is a nature-loving mum passionate about learning to live better with less. Working in threatened species conservation she has gained an increasing appreciation of the huge impact our consumption habits have on the environment. She hopes to inspire other families to live a little better with less too. Having recently made a 'tree change', you'll now likely find Tricia excitedly playing outdoors with her daughter, adding to her small flock of chooks and pottering in her new garden. Read more of Tricia's adventures at http://littleecofootprints.com/. This is definitely something that has been on my mind! For a month we've been bombarded with toy ads and toy commercials and huge store displays. All my boys seem to know how to say anymore is, "I want that!" We always only do two toys, like you, but it seems like every year those two toys get bigger and bigger. Hoping I can find some inspiration to scale things down this year. Keeping the gifts small and simple is something I think we'll struggle with in the future as well. Good luck finding that inspiration. I have already been prepping my kids to decide on 2 things they they really, really want. Every time a commercial comes on they scream "I want that!" So last night we started narrowing down. Santa is going to bring only one or two gifts to each of my children this year. Less is definitely more! Yes, TV and displays in shopping centres don't make keeping things simple easy. I think we'll try and avoid both shopping centres and commercial TV for most of December. We've been limited gifts to a small selection since our girl's first Christmas. These days we do something to read, something to wear and something to play with, plus a handful of small things (mostly art supplies) from Santa (or the Christmas Angels as my girls don't like the idea of Santa at all), and one gift each from our family. Now if we could only get the 'less is more' message across to extended family... then it would be great. We've tried in the past to get extended family to give money towards things like violin lessons or a Zoo pass, but most of them are not keen on this idea at all. Any tips on how to encourage this with extended family? I like that 'something to read, something to wear and something to play with'. I also like the idea of money towards activities. I struggle with extended family gifts as well (The pic above is Little Eco with just some of her gifts from extended family last year) so don't have any great advice sorry. I know in the past i've come across as ungrateful when i've suggested Little Eco didn'ty need to much. I think most of our family understands that we have been trying to simplify and declutter so it will be interesting to see what happens this year. Oh I do love this idea and think I may need to try and adopt this philosphy. We are not monetary rich by ANY means however my inlaws are and I feel like I need to compete with them when it comes to gifts and it gets EXTREMELY expensive and like you said the kids just unwrap and push aside, unwrap and push aside. I remember turning up to my inlaws last Christmas to find my 2 nieces and newphew (all under 5) with Santa sacks that were 1.5 x 1.5 m FULL and over flowing. Sounds like a challenging situation. Although, I do remember feeling guilty at Christmas when my mum had clearly spent more on us than she could afford. I remember wishing she hadn't spent so much. I imagine your children would appreciate a little less from you as well. The last several years, we have had the kids chose 3 things...something they need, something they want, and something to read. We chose the number of 3 things because Jesus got 3 gifts and wanted to keep the kids in the right frame of mind for the holiday. I like the '3 gifts' link to the real tradition of Christmas. The tradition of Christmas is easily lost in amongst all the commerial hype. Meredith, I love this idea and the sentiment behind it. I think this afternoon I will be going through the amount of presents I have bought for myself and Miss 3 and hubby and will be cutting it down. I will ALSO be reading her stories about jesus and how he got three gifts so that on Christmas morning when we all receive three gifts, she will understand! Coming from a Catholic background I think the 3 gifts idea is great. Not only does it relate back to the story of Jesus, the reason Christmas is celebrated at all but it seems like a fair number of gifts to receive. absolutely! I have started to make my children's gifts and it is accompanied by one classic that they love.... this year we will be doing some books, and maybe a pet bird for my oldest. I love Meredith's idea of 3 gifts just as Jesus received - this may be our new tradition! Oh, Tricia, we are thinking along the same lines. I have a post ready to share on Thursday with a similar sentiment. I am so glad you are encouraging the less is more too. It really is. You are doing a wonderful job here planting the seed of an idea into so many—a way to make the holiday more meaningful and more full of joy for what we have and are given. Nice post. I'm looking forward to reading your post Heather. I just notied your post on the camping party. We'd like a camping party for Little Eco's birthday next year so I LOVE your inspiration! I was a child of the great depression in the early 1930s and I honestly don't remember what gifts I received for either Christmas or birthday (within a few days of each other) but I know whatever the gifts were they would have contained much love from both parents. When I was 7 WW2 began and the shops were devoid of much choice for gift giving. I loved to read and my dad would go to the auction rooms and buy a stack of secondhand books for me. Mum would perhaps make me a new dressing gown or similar and there were always some new pennies in the bottom of the sack. People today have lost the value of true giving and I notice with my great-granddaughters the same as you said Tricia.....opening one gift after another without taking it in. Yes I feel less is the way to go and one can always buy a gift and pop it under the tree at K-Mart (or similar) for other more unfortunate children. Your idea is wonderful. I am nearly 80 so come from an entirely different world to modern children and parents so I guess I see things differently.. Thank you for sharing Margaret. I agree that 'People today have lost the value of true giving'. I remember my grandparents handmaking a gift for each of their grandchildren each Christmas and birthday. I still have many of the gifts they made us. I love this Margaret! We keep it simple here. Kids are so fortunate to have their family, other children to play with, a great country (in so many ways) and nature. They don't need much else at all. Tricia, great post. We do two things, except for the eldest who will have one thing this year. Thanks again Trish! You are the voice of reason yet again. I'll talk to hubby about this tonight. We try to stick to this old saying- "Something they want something they need something to wear and soming to read." I have never heard that saying before but I LOVE it! It's actually exactly what we're planning for Christmas this year but the little poem will serve as a nice guide for Christmases in the future. Thank you so much for sharing this! Great post Tricia, and something I for one, always need a bit of help to remember (I can get carried away with the 'giving' spirit). This year we're giving the kids each a scooter, a book, some lego and some homemade things - pjs, a new apron and a few items for the dress-up box. The scooters are expensive, but they will be used as transport for school next year (and they'll help us with our daily green hours!) so I'm happy with that. 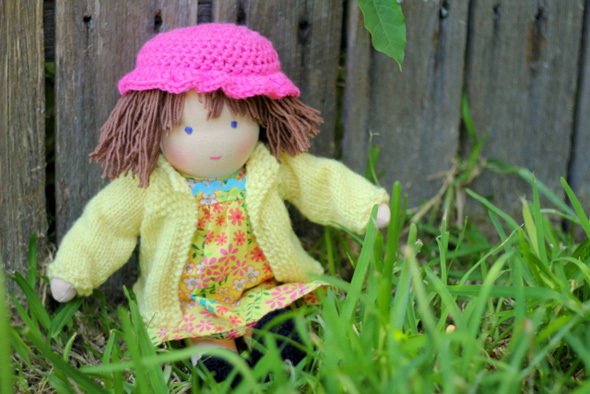 Oh, Doots received a Little Jenny Wren dolly for her 5th birthday, lucky girl. They are gorgeous Dolls aren't they. I agree Scooters are a good investment. I saw a mum riding her scooter to school with her scooter-riding kids the other day. How cool is that! I wish I was brave enough to ride a scooter. Looked like fun. We are going along the same lines as Angela this year. Second hand book, second hand clothing item, something they want (from their exhaustive Santa list) and something they need (swimming goggles!). Santa will bring them a combined present (a trampoline, also second hand), a few bits that I am making and some craft supply stocking fillers. The kids save all year to buy each other something (one present each from all of their siblings). I take each one in turn to the shops to shop for their selected person. A bit of Mum time wrapped up in some Christmas giving. Love it. The extended family are a whole different story! We don't "do" santa at our house (I've blogged about it here http://www.countrylifeexperiment.com/2011/10/santa-doesnt-stop-here.html ) so all presents come from mum and dad. We definitely try to limit the presents to 2 packages, and also to be thoughtful about what we by so that there is a small range of items that are useful and fun for more than 5 minutes. It really is hard to tone down the extended family at times though. I have started suggesting books for my oldest 2 because I figure a few books don't take up a lot of space but they bring a lot of enjoyment. I suggested books to my mum, but then she started gifting five books at a time each time she visited. Now we're stuck having to declutter the books. It's hard, because I know she means well. I think my papernts generation (and uch of my generation) are trapped thinking that the only way to show your love is through giving. My daughter's birthday is the week before Xmas so she seems to have a 10 day festivus of having gifts thrust upon her. I love the idea of simplifying the gifts. We only give her one or two things from ourselves and then fill a stocking with small, useful things from Santa. Last year she got an art easel from us and Santa had thoughtfully got her paints and chalk as well as tshirts and a Wonder Woman costume. This year for my daughter's 2nd birthday I started a tradition of sending some older, less useful toys to charity, we did it together, I've decided to do it at christmas too. I always prefer to give one really great present, and watching her totally freak out and refuse to open any more presents from the mountain supplied by her grandparents etc my opinion was utterly reinforced. I like to get gifts with a real meaning, for her birthday she got some fish (compassion, responsibility and that old life and death chestnut) for christmas she's getting an outdoor art kit, she loves to paint but our house is so small and rented. The rest of my family will be getting small, handmade gifts from local creative types and some homemade cookies. Christmas is about love for the world, not putting more crap into it. Thank you for a great blog! I love this. Other kids always scoff at the small number of presents my daughter receives for birthdays and Christmases - she's only 3 so doesn't care, but we really hope to keep that going and teach her what's really important. Yes, this is exactly what we're going as well- one toy from us and one toy from Santa. Simple. Our little ones will be overwhelmed enough! xo m.
I love the idea of the 3 items. My 3 children are getting a good quality (so a little bit more expensive) trampoline to share and should last them their childhood, and grandparents on both sides are contributing. My youngest is 6 months and won't know what is going on , but at least getting a large combined present prevents grandparents feeling as though they need to get him something else. For all the nieces and nephews I have bought new summer pyjamas and a small toy (I am a big fan of schleich animals and replica farm machinery, the same as what we have here on the farm, so the relatives get a little piece of farm life to associate with my kids lives here on the farm). For the older cousins, they choose an animal from the Taronga Zoo website and we sponsor that animal for the year, and the zoo sends them info and updates via email throughout the year. We are having a beach christmas this year, so new swimmers are on the present list and a small toy. That's it. My childhood christmas gifts were made up of new underwear, a new lunchbox or schoolbag, pencil case and pencils etc, ready for the new school year plus one or two toys, and all wrapped in old newspapers. My Mum was ahead of her time. Great ideas!! My daughter has a money bank and one slot is labeled "Share." We will empty it soon and she gets to choose a charity/etc to give it to. Also, she just went through her toys and picked out the ones she didn't play with anymore to give to charity. And for advent, we are doing activity cards instead of gifts. We definitely try to show her how important it is to give back, and that less is often the best way to go. Kids who have too many toys don't even know which ones to play with because it's too much to process! Although I support the 3 gift tradition, it pains me to say that there won't be any gifts at my house this year.